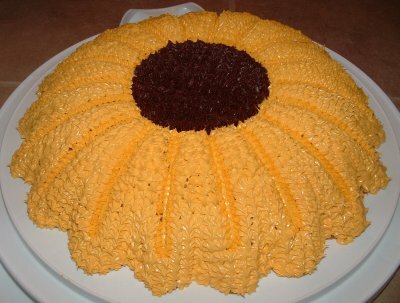 I had a family reunion to attend (which is pot luck) and I thought that a Sun flower cake would be both fun and delicious. I use the Wilton sunflower pan to bake the cake in. Before putting the batter into the cake pan I used the Wilton Cake Release and I applied it with a pastry brush. I usually use Professional Pam and I think that next time I would use the Professional Pam. The Pam is quicker and has no clean-up. Just make sure you spray generously. After the cake was cooked I let it cool approximately 15 minutes and then I cut the bottom off of the cake. I did this when the cake was still in the pan to make it straight. Then I flipped the cake onto a cooling rack to completely cool before icing the cake. As for the icing I tinted the icing with the Wilton gel colors. The gel colors are fantastic! This time I tried to ice the cake with Betty Crocker icing. I used the Betty Crocker Chocolate to the center of the sunflower cake. I used tip #21 and the chocolate worked fantastic. I then used the Betty Crocker Vanilla for the rest of the icing. The vanilla icing was too thin of a consistency which made the icing a little too runny. For sure use the Wilton pre-made icing; it is definitely worth the extra money! For the lines around the petals I used the tip 5 and then I rotated between tip 16 and tip 18 for the rest of the petals. Everyone loved the cake, but I was a little disappointed because I know how good the icing looks when you use the Wilton icing. 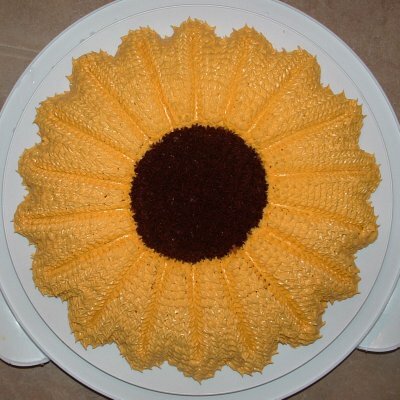 You can’t help but smile when looking at a sunflower and especially if you are looking at a sunflower cake.